Hello space pioneers, this is CCP Fozzie! 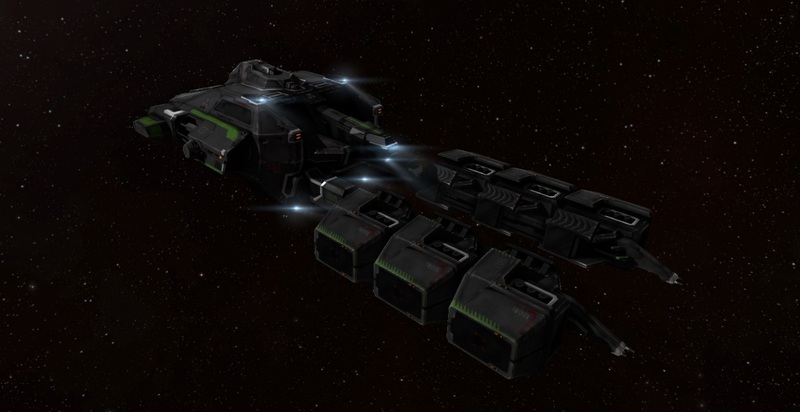 I’m happy to be introducing one of the new ships coming to EVE Online in our upcoming June 3rd release, Kronos. I really hope that you have all been enjoying Fanfest so far, whether in person here in beautiful Reykjavik or through our free live stream coverage. Many of you will have just watched the EVE Online keynote where we demonstrated some of the exciting updates coming in June and beyond. One of these reveals was the first in a new class of advanced mining frigates, the ORE Prospect. The Prospect is the first Expedition Frigate, a new class of ships designed by Outer Ring Excavations and their subsidiaries that enable brave capsuleers to chase riches in the frontiers of space. After the runaway success of the Venture mining frigate, ORE spun up their growing frontier exploration and exploitation division into a new subsidiary called Outer Ring Prospecting. This team was tasked with developing new and improved technologies for resource collection in the most hazardous parts of known space, wormhole space, and beyond. The first fruits of this endeavor came in the form of a new Tech II mining frigate, based on the Venture hull. The Prospect is the first ORE ship capable of using Covert Ops Cloaking Devices, allowing it to warp while cloaked and move securely through many dangerous situations. The Prospect is small, fast and agile enough to avoid most hostile fire, but manages to pack an upgraded mining fit and larger ore bay into its compact frame. The larger cargo hold is sufficient to comfortably carry a Mobile Depot, greatly expanding its options once it arrives at its destination. Can fit Covert Ops Cloaking Devices and Covert Cynos. Cloak reactivation delay reduced to 5 seconds. The process and cost of building a Prospect is similar to other Tech II frigates, with Blueprint Copies (BPCs) invented from a Venture. This ship opens up many options for enterprising pilots. It mines gas at the same class-leading rate as a Venture, with the added advantages of a much larger ore hold, covert ops cloaking and the ability to carry a Mobile Depot for improved Fulleride expeditions thanks to the ability to switch out modules with a deployed mobile depot. Blessed with a small signature radius and extra hitpoints, a Prospect equipped with a Medium Shield Extender and a 1MN Afterburner can easily tank nullsec asteroid belt NPCs. The same technology that allows the Prospect to use Covert Ops Cloaking Devices also allows it to light Covert Ops Cynosural Fields and jump through covert portals opened by Black Ops Battleships. At the same time that the Prospect is released, we will also be making a series of changes to some ores and mining sites designed to increase the viability of mining in dangerous space—especially low security space. First, we will be expanding anomalies full of Hedbergite, Hemorphite and Jaspet into low security space. These sites are currently only available as very rare spawns in high security space, and with Kronos they will also appear in low security space. The current price of Nocxium means that at this time these are the most valuable mining sites in the entire game in ISK/hr. With the Kronos release we are also expanding some of the formerly nullsec-only sites, namely the small Arkonor and Bistot sites, into low security space. The Hedbergite, Hemorphite and Jaspet will be on the more common end of the lowsec spectrum, while the Arkonor and Bistot sites will be on the rarer side. We are also making some adjustments to the composition of three key high end ores. Arkonor, Bistot and Crokite (known as ABC ores) are three of the rarer ores in New Eden, and will be enjoying increased yields this summer. We are adding Mexallon to Arkonor, increasing the Pyerite in Bistot, and increasing the Nocxium in Crokite. These changes should help cover some of the holes in mineral supply for local producers in nullsec, as well as increasing the return for “ninja” miners taking trips into lowsec and nullsec space. The following values are per batch, using the new unified batch sizes of 100 that were announced in our recent reprocessing dev blog. All other mineral values remain constant. We hope that these changes will add some excitement for the pilots interested in trying out frontier mining, and that they will pair especially well with the new ORE Prospect frigate in the Kronos release. We look forward to your feedback on these changes and hope that you will take the opportunity to give this new ship a spin when we make it available on our Singularity test server soon. I hope you enjoy our final day of Fanfest live-stream coverage on May 3 and that you’re as excited as I am to welcome the newest addition to EVE’s fleet of mining vessels: decloaking soon in an asteroid belt near you.